Spartanburg builds the X3, X4, X5 and X6 crossovers. The X7 comes online next year. 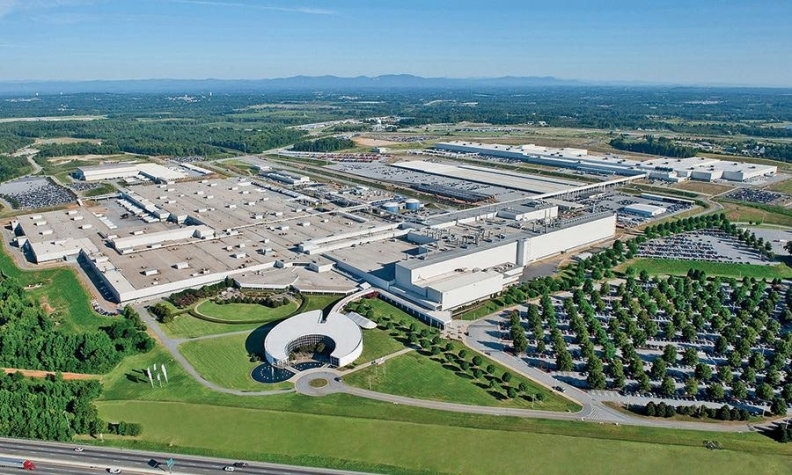 SPARTANBURG, South Carolina — BMW chose this city for its first North American plant 25 years ago, viewing it as an ideal base for plans to become a bigger player in the U.S.
Today, with that goal behind it, a majority of the vehicles rolling off the line here are destined for a customer in one of 140 other countries instead. About 70 percent of the plant's output leaves the U.S., making Spartanburg the country's largest vehicle exporter by a large margin over runner-up Mercedes-Benz in Alabama. BMW CEO Harald Krueger touts the Spartanburg plant as a testament to free trade. It's a point the company has been making more frequently since President Donald Trump took office. "I'm not concerned, but we need to play our role to make clear and take this plant as an example," Krueger told reporters during a visit to Spartanburg this year. "With free trade, with the open markets, the United States is benefiting from that approach." BMW has benefited as well. In 2015, Spartanburg passed BMW's plant in Dingolfing, Germany, to become the company's largest assembly operation. Spartanburg produced 411,171 vehicles in 2016, fifth most in the U.S. and sixth most in all of North America, according to the Automotive News Data Center. It's a huge transformation from the small operation that started out making only about 60,000 vehicles annually after opening in 1994. Nine thousand workers here build four crossover nameplates — the X3 through X6 — that play outsized roles in BMW's global growth. The company's biggest vehicle yet, the long-awaited X7, will make five models when it launches late next year. Multiple variants and trim options mean the plant could run for six months straight and not make a duplicate vehicle. 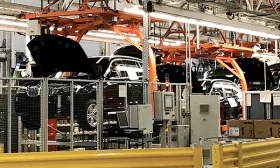 "They located the plant to serve the local market, but the unique aspect, like the Mercedes plant, is the majority of the production is actually being exported," Ron Harbour, a manufacturing consultant with Oliver Wyman, told Automotive News. "And that's very different than all the other transplants built in the last 30 years in North America." 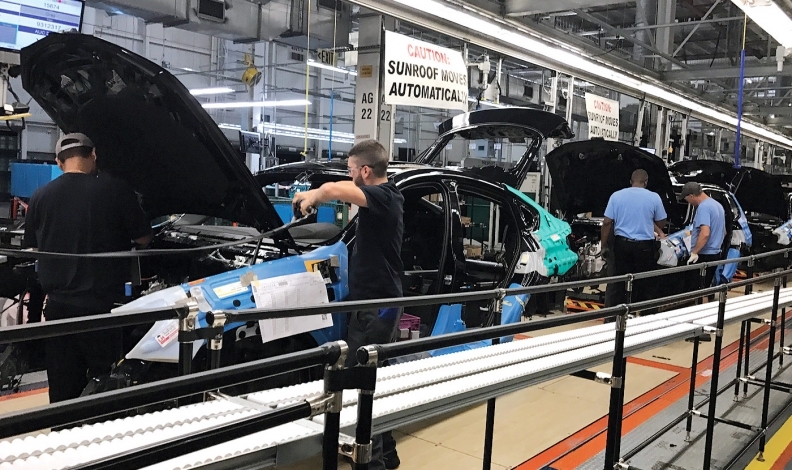 Based on volume and type of product — high-margin, in-demand crossovers — Spartanburg is among BMW's most profitable locations, if not the single most profitable plant in its network, said Joe Langley, associate director of North America forecasting for IHS Markit. "It's a massive complex," Langley said. "It's the global home of their core X models. It's not part of the German-focused, Europe-centric production footprint, but it's not second-rate by any measure. It's one of the most high-tech plants they have." Annual capacity has grown to 450,000 vehicles, a size that sets it apart from plants operated by BMW's European competitors. Spartanburg built more vehicles in 2016 than Ford did at either of its sprawling plants in Louisville, Ky. When rival Mercedes announced in September a $1 billion investment in Vance, Ala., that company's production boss, Markus Schaefer, shut down speculation that the Mercedes plant could expand to Spartanburg's scale. Vance, which produced about 300,000 vehicles last year, is already the ideal size, Schaefer said. An operation the size of Spartanburg is too unwieldy, he argued. "We think 450,000 is a very good number for a plant," said Knudt Flor, BMW's plant chief in Spartanburg. "You should not extend it endlessly." The 450,000 number is what the plant can produce in normal shift mode — two shifts working six days a week — Flor said. If that capacity was "overrun" by demand, managers could push output by adding Sunday work and adjusting shifts, but that strategy would only be used for short periods, he said. In such a scenario, Spartanburg production could approach 500,000 units, roughly matching BMW's total global production in 1992, when it decided to build in South Carolina, said Oliver Zipse, the BMW AG board member in charge of production. "So the complete size of the company was only a little bigger than this plant," Zipse said. "There was no need to think about how do we organize networks, and it was very simple then. When it grows, we find out we must have a substructure, and we [determined] centers of competency for specific projects." Though it initially produced the 3 series and then the Z3 and Z4 roadsters, Spartanburg became BMW's center of competency for crossovers and SUVs. Production of the X5 began in 1999, followed by the X6 in 2007 and the X3 in 2010. Spartanburg is now one of BMW's four lead plants worldwide, Zipse said. Volvo is building its own assembly plant about 30 miles from the Port of Charleston. Volvo leaders cited the state's experience with BMW as a positive when it announced its plant investment. "They're piggybacking on all the benefits BMW has brought to the region, including the Port of Charleston and how that has significantly grown, too," said Langley of IHS Markit. "Since Volvo is going to leverage their plant as a global hub as well, it's a pretty smart move." Today, Spartanburg sprawls across 1,150 acres. Despite the name BMW uses, the plant is actually midway between Spartanburg and Greenville, near the cities' 13-gate international airport in Greer. Preparations to build the redesigned X3 and X5 have caused plant output to fall 11 percent this year through September, though that's expected to be a temporary dip. BMW plans to add 1,000 workers at the plant by 2021. All vehicles built at Spartanburg are produced for a customer or dealer order. BMW touts the plant's ability to let a customer change the order until six days before the scheduled build. One way the plant gets such flexibility is through kitting, Flor said. That's when a worker picks certain parts for a specific vehicle and puts together a package delivered just in time to the assembly line. "This little package walks down the line with the car," Flor said. "It requires one more person to pick these parts and some equipment, but this is a great tool to achieve flexibility." "It comes back to the whole philosophy that powertrain is the heart of BMW, and they really want to keep that last bit of Germany attached to their vehicles," Langley said. "But eventually I wonder what is the tipping point to say, 'We have to do something locally.'" BMW's second North American assembly plant, under construction in Mexico and slated for a 2019 opening, could provide the impetus for that, Langley said. It is expected to increase BMW's annual capacity in North America by 150,000 units. A BMW spokesman said there are currently no plans for a U.S. engine plant. The industry's move toward electrification could play a role in whether local engine production makes sense. BMW's sole U.S. plant has increased production significantly over the past decade. Going forward, the just-redesigned X3 won't be built only in Spartanburg. BMW will launch assembly of the X3 next year in South Africa and China. That was the first decision Zipse made two years ago after being named global production boss. More capacity was needed, and "it was too dangerous to put all X vehicles into this market," Zipse said. BMW also is said to be planning secondary assembly of the X5 in China, though officials haven't confirmed that. Still, multiple assembly sites offer flexibility not just for change in market demand but also in trade policy. Going forward, BMW says it expects to continue exporting about 70 percent of Spartanburg's production. But Krueger could make an exception if U.S. policy changes — threatened by the Trump administration — jeopardize BMW's business model. "If we would have trade barriers," Krueger said, "maybe we would need to shift that production from here to somewhere else because it can no longer be affordable."